What did it mean by he was no more? Not much is known about Enoch, so we are left to wonder, but there is some information that can help us. Enoch is the son of Jared, and the father of Methuselah, who was the father of Noah. So he was a very important person. Twice it is mentioned in the very short account of Enoch, that he walked with God, so obviously that was very important. 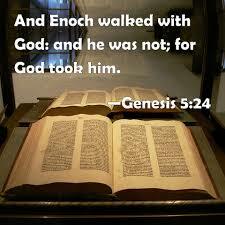 And while his contemporaries lived 700 years or more, Enoch was taken was he was only 365 years of age. So the question remains, why did he die so young, without much mention if he was so important. Or does the answer sit in the fact that God took him, before death, at a (at the time) young age, because He had a greater plan ahead for him. This is really something that we cannot and won’t know the answer to, until God reveals it. On a side note, by my interpretation, there were only three people that ascended to Heaven without dying. Enoch as told above, Elijah in 2nd Kings 2:11 and Jesus Christ in Luke 24:51 (also Acts 1:9). I’ve found no other references to living people ascending into Heaven.